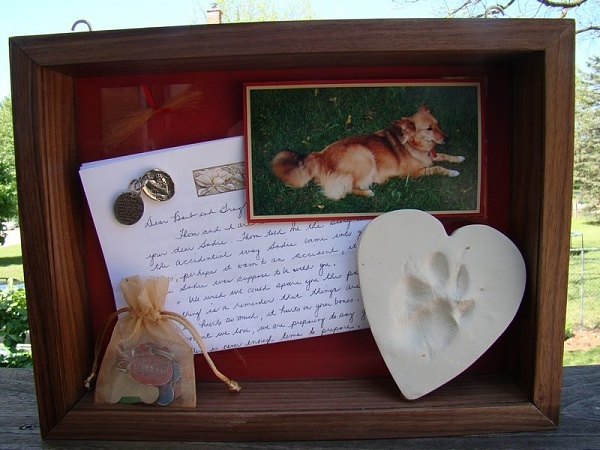 Creating a memorial for your pet can be a lovely way to say goodbye. Spend time creating a unique hand made memorial, or use a casket or stone plaque. There are many ways to remember your dog, cat, or any best animal friend. When the time comes to say goodbye to your pet, nothing will make that grief any less real. You’ve lost a member of your family and an innocent life that you loved dearly. Here at CPC, we understand your pain. We strive to do everything we can to support you through your hardest time. This includes passing on some of the ideas for pet funerals that we’ve learnt over the years. There are many ways to say goodbye to your pet, and not every idea will suit every person or family situation. Talking things through with those closest to you can be a positive step in the healing process. 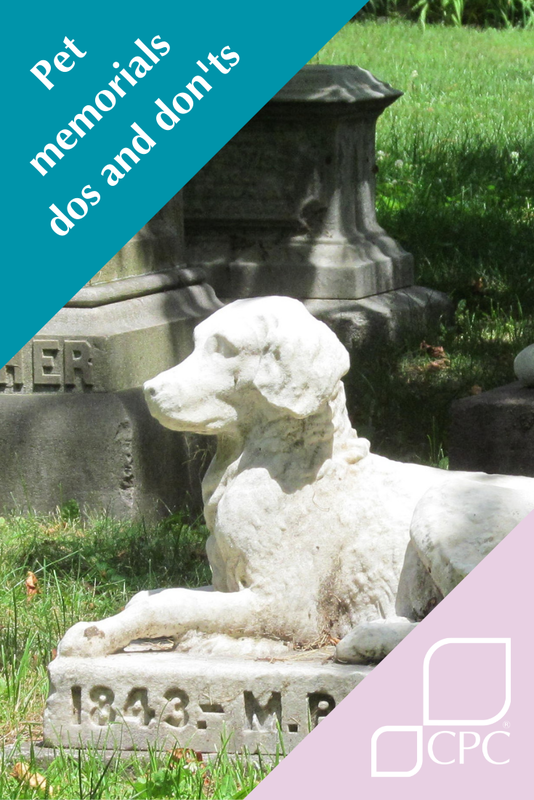 We’ve gathered some Dos and Don’ts for planning your pet’s passing, along with some lovely memorial ideas for you to consider. – Do plan. Planning for your pet’s passing can be a great comfort, knowing you do not have to make any decisions when you’re not in an emotional state to do so. – Don’t get another pet straight away, allow yourself time to grieve. – Do consider all family members’ viewpoints and remember everyone grieves in their own way. – Please don’t release balloons (even biodegradable) or Chinese Lanterns as a memorial idea. These are not great for the environment and other animals. Look for some earth-friendly alternatives. – Do allow other pets in the household time to say goodbye. Pets grieve too and seeing their passed friend, especially for cats and dogs, can help alleviate pining. – Don’t make decisions about burial over cremation until you’ve spoken to the landowner or looked into the amount of work required to properly bury an animal. – Do take your time when making decisions and do what’s right for you after talking through the options. – Don’t bury your pet in a too-shallow grave; the heartache of that grave being disturbed will be tragic for you and your family. – Don’t use floating lanterns in ponds and lakes, or any other foreign materials as a memorial. These can prove deadly for aquatic life, and the surrounding environment. – Do consider some homemade ideas for memorials, such as scrapbooks, memory boxes etc. The making process can be a lovely way to remember the good memories. – If you’re considering a memorial tattoo, do not get your pet’s ashes mixed with the ink. This is not recommended by good tattooists due to the process putting an unhygenic foreign object into your skin. Consequently it can lead to nasty infections. – If you’re considering a memorial tattoo, do talk to a good tattooist about your options. Things like paw prints and pictures are quite popular. Consider getting a paw print taken before your pet is cremated or buried for the tattooist to work from. We’ve seen some lovely memorial idea over the years. Some have been permanent fixtures while others can be moved around the house or to different homes to go with you, keeping your pet’s memory alive. We’ve had a look round and come up with a few noteworthy ideas for you. We have a wide selection of caskets and urns to fit into most home decors, meaning you can have your Pet’s ashes in their favourite room. Keeping their ashes in a casket in your house is a lovely way to have your pet fit seamlessly back into your life, just as they did when they were alive. Other ideas for memorials include scrapbooks and memory boxes, sometimes called shadow boxes. These can include photos of your pets, perhaps a token ash, their favourite toy or collar, and other memories. These can be beautiful homemade personal arrangements that are therapeutic to make as a result. There are some great instructions on how to make a shadow box online and we particularly like this post on CraftForums.com. Missing the feeling of your pet can be one of the hardest parts of losing your companion. Not having your favourite fur ball to cuddle up to can be a huge wrench. While there’s nothing that can replace that feeling, having something to cuddle such as a cushion or a blanket can be a good comfort. Other ideas include a cast of your pet’s paw print to feel, pet themed jewellery or, for the more adventurous, paw print tattoos are a nice idea. If you’re considering a tattoo, please go to a good studio and do not mix your pet’s ashes with the ink! Maybe you’ve decided to bury your pet’s ashes? You may wish to consider an outside memorial. 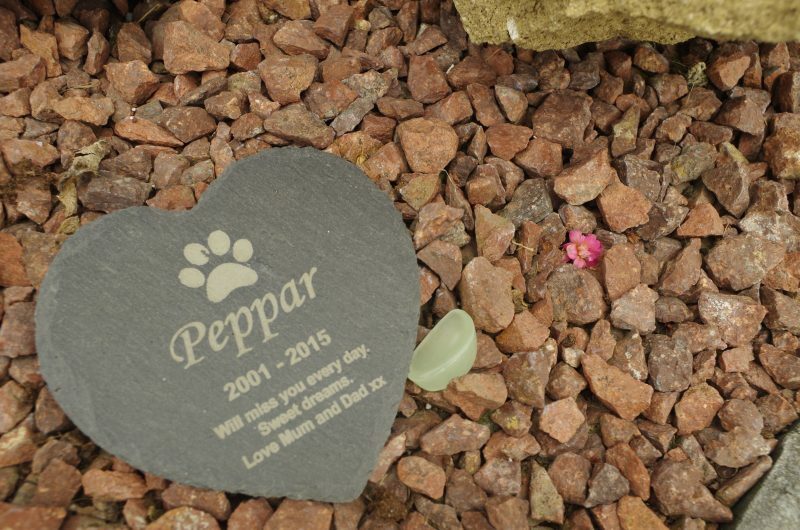 Headstones and plaques are a good option for marking your pet’s resting place or his favourite place. We offer a range of caskets and urns or for a wider range you can visit Urns for Ashes. In addition, another idea we have read about is to dedicate a bench to your pet and have a memorial plaque installed. This can be a bench or chair at your own home or in your favourite park or walking spot. Be sure to contact the relevant council to discuss your options. As a lasting memorial to help other pets, you may wish to make a donation towards your favourite charity in your pet’s honour?This donation will ensure other animals and pets will continue to benefit, even after your pet has passed. 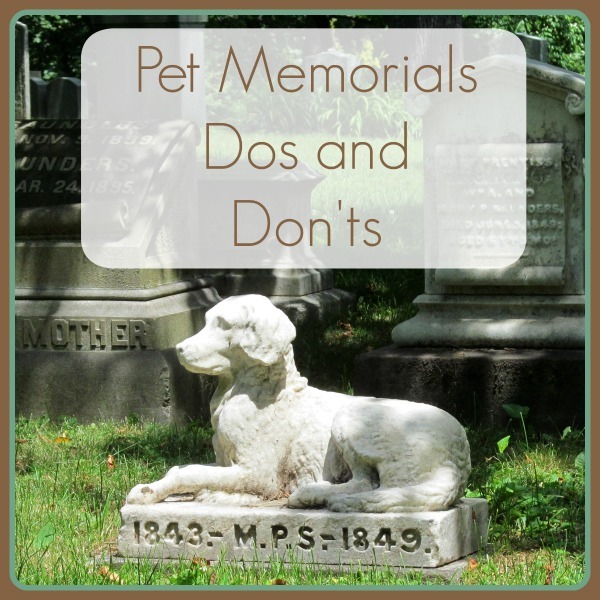 We hope this post has given you some ideas to help cope with pet loss. It’s not an easy topic to discuss. We believe strongly in our role as a compassionate service. We treat you and your pet with the highest dignity.